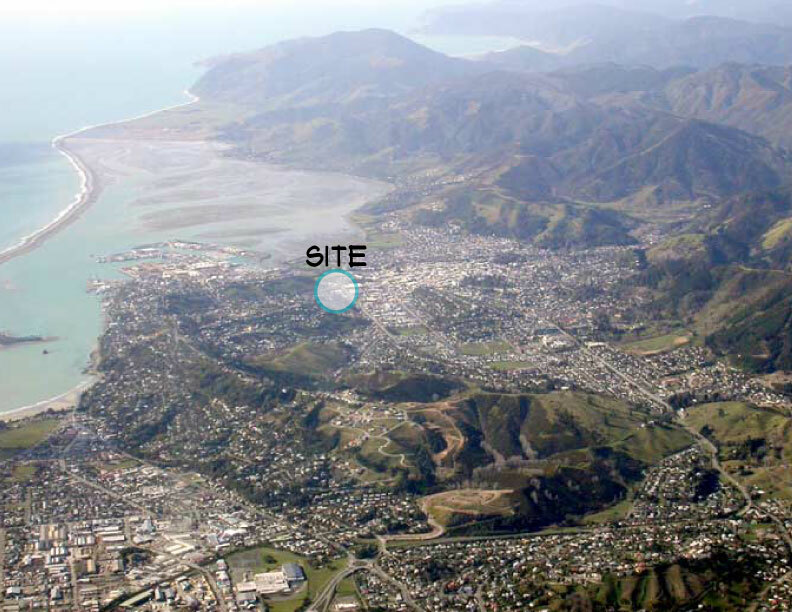 Above: Aerial view of Nelson South. The slope is exposed to the East, South and West winds; the East winds are often the most powerful, sudden, and destructive. The site is mid-slope, so that the frosts can be seen rolling down the slope and continuing down to the commercial area below. The slope is steep, ranging from 1:4 to 1:2 or greater, and erosion is a continuing issue. There are signs of previous houses on the site, and some chunks of concrete and shards of pottery are strewn across the lower reaches of the site. The primary use of the land is for food production, but with species that do not leave much for the city rodents! The auxiliary purpose is to increase the planting of native species and promote a more productive landscape with minimal erosion, to build up the soil quality. The blackberry and gorse overgrowth was recently mown by an 18 tonne digger and “Mulching Head”. The stripped surface has grown over again with a succession of challenging weeds. At present, the grasses cover a large proportion of the surface and help keep the soil on the slope. Eventually, these grasses, mostly couch grass and other exotics, can help build layers of mulch and mycelium biological activity to break down the cellulose fibers into soil. In the interim, deep rooted pioneer plants like plantain and dandelion can be encouraged to break up the subsoil and bring up nutrients. Another tree that is in place is tagasaste tree Lucerne. Since it is a legume, it grows quickly and fixes nitrogen in the soil. The tagasaste is short-lived, and several have died on the site and become windblown snags. These would function better in building soil if chipped, or simply by separating the tree branches, to place along the contours. With the wood in contact with the humid soil, the mycelium can colonize and break down the cellulose, and other bacteria can work to build the soil. In selecting plants for this area, the lack of irrigation leads to find plants that withstand drought. This technique is defined in Permaculture as hugelkultur. Effectively, there are healthy native plantings on the neighbour’s property. The neighbour’s success suggests continuing with placing native plants, such as Ake-Ake, harekeke flax, and hebe bushes, but hope to use some trees for long term timber harvest. Manuka and kanuka are well known as successful pioneer plants, and will shade the gorse and blackberry as well. The timber is attractive and can be the best firewood when seasoned, so are good selections for early planting, to help protect other trees in the early days. Totara is a prized timber for its resistance to humidity, and several totara are growing well on an adjacent property. Kowhai is also growing well there, and attracts the birds with early spring nectar. Rata and pahutekawa are fast-growing and decorative plants to include in this prominent urban site. Located in the heart of Nelson, New Zealand, Pioneer Permaculture Studios (PPS) aims to embody the term ‘sustainability’ in all its myriad of meanings.